Distribution: Widespread. Temperate to cool regions. Description: A biennial plant. In the first year it has a basal rosette of very large triangular to heart-shaped leaves with a rough texture. The leafstalks can be a deep red-purple, darked near the base. During the first year, Burdock uses these large leaves to produce and store energy in its taproot, which can grow sometimes grow up to ten feet long, straight down. They can be very difficult to extract, but their edible root makes them a good plant to know. The root is a good source of starch. The root bark, which is dark brown, scrapes off easily and it may need to be boiled in changes of water to remove bitter components. In the second year, Burdock uses the energy stored in its root to grow another set of large leaves and a woody flower stalk, which is branched, and can regularly reach 5 feet high. The flower clusters are on the ends of the stalk and are spherical and covered with many hooked bristles which can cling to fur or clothing. The flowers are a brilliant purple. Edibility: The long taproot is edible and is a good source of starch. It also has a good and unique flavor. It is actively cultivated and eaten in many parts of the world. Farmed burdock is grown in loose, sandy soil resulting in long straight roots. Wild Burdock roots are less regularly-shaped. You can sometimes find budock root in sushi bars, where it is called Yamagobo (literally: mountain root). After the roots are harvested they should be boiled in changes of water to remove bitterness. Medicinal: A tincture or tea from the root is said to be a liver cleanser and/or blood purifier. It seems to have been used medicinally, as well as for food, by every culture living within its range. Everyone can benefit from Burdock tea, and it is quite good. Poisonous: Burdock tea and tincture seem to cause your liver to flush toxins, which are released into the bloodstream before being picked up by the kidneys and removed from the body. 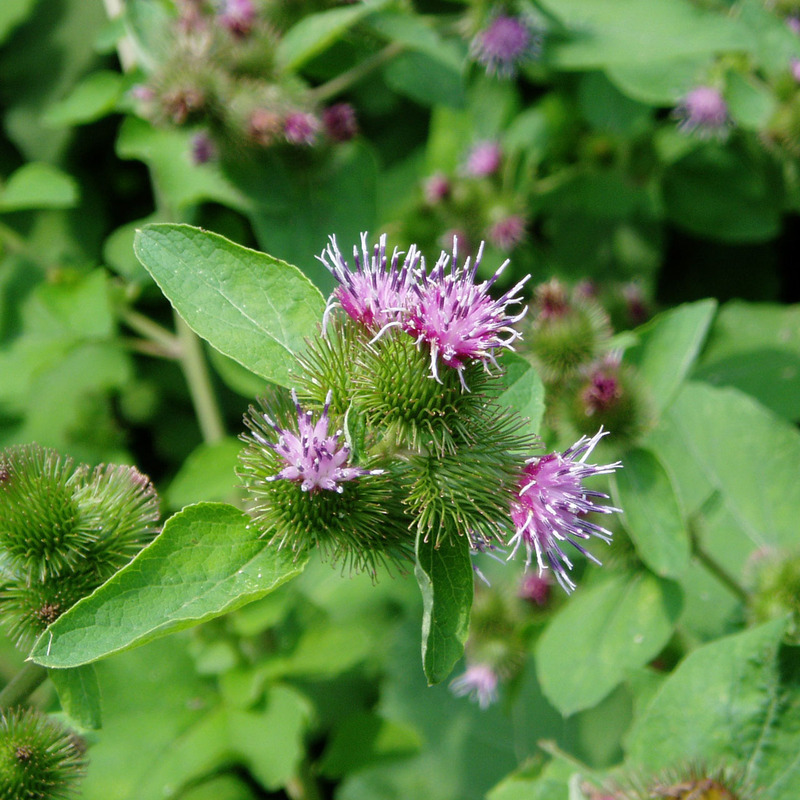 For this reason, using Burdock medicinally while fasting can be very dangerous, as your body is in a weakened state when the toxins are released into the bloodstream. Utilitarian Uses: The large leaves can be used to wrap food for pit cooking.They can also be used as makeshift plates. Also good as an improvised funnel. Single seed pods (which were actually the inspiration for Velcro) can be used like velcro to hold fabric together; if you lose a button on your shirt, for example. Other Notes: Since the taproots are quite long they can be very difficult to harvest from the ground. The best trick I have heard of is to use a post-hole digger and remove a column of soil directly alongside the root. Then the root can be pulled laterally into the hole, and in this way it offers much less resistance than trying to dig out around it and pull it up.